Wales legend Liza Burgess was today inducted into the World Rugby Hall of Fame at a special ceremony in Rugby, England. 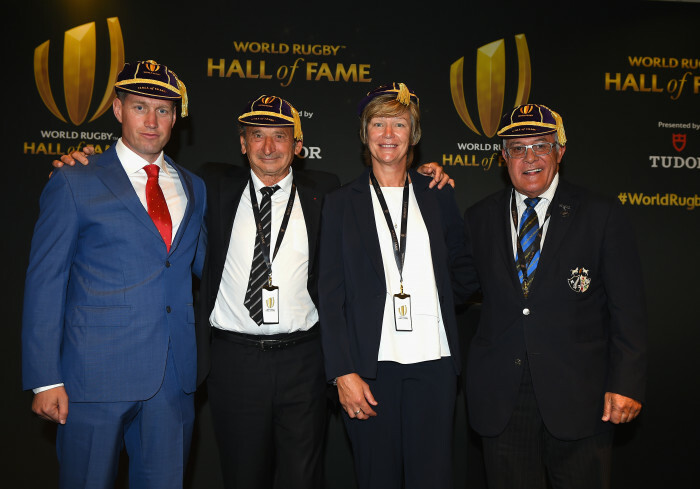 She was inducted alongside Ronan O’Gara, Pierre Verillepreux and Sir Bryan Williams. Burgess, known as Bird, said: ‘It is a huge honour and privilege to be inducted into the Rugby Hall of Fame. I feel incredibly humbled and proud and would like thank everyone throughout my career who has contributed to this’. Burgess became just the 10th woman to be inducted into the Hall of Fame out of 142 inductees so far. She has been at the forefront of Welsh women’s – and international rugby – for nearly three decades. During an illustrious playing career she played in Wales’ very first international against England in 1987 where she led the side from number eight. Burgess captained Wales on 62 occasions, participated in six Women’s Rugby World Cups – four as a player and two as assistant coach – and was assistant coach for the inaugural Barbarians women’s team in 2017. Burgess first played rugby at Loughborough University in 1983 where she was fortunate to be coached by fellow World Rugby Hall of Fame inductee Jim Greenwood, who was also her Great Britain coach. On graduating, she joined Wasps before going on to enjoy a hugely successful 10-year spell at Saracens, the club she helped to form. An inspirational leader, Burgess led the side to the very first treble recorded in the women’s domestic game (League and Cup in 15s and the National Sevens). Since hanging up her boots, Burgess has become forwards coach to Wales women, head coach of the national women’s U20s and an assistant coach at the Gloucestershire-based Hartpury club, while still holding down a job as assistant headteacher at Downend School in South Gloucestershire.